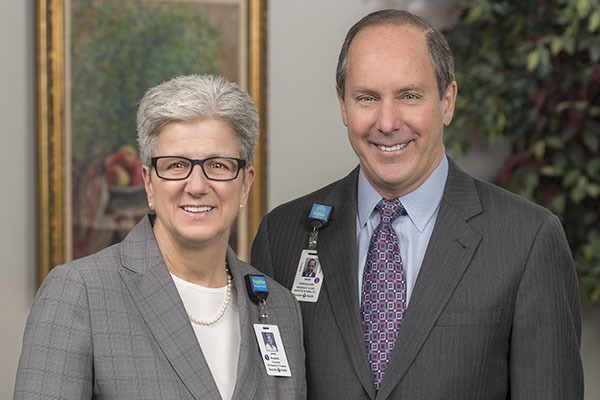 A Message from Mark A. Keroack, MD, MPH, President & Chief Executive Officer, Baystate Health and Anne Paradis, Chair, Baystate Health Board of Trustees. As we look back on 2016, it was a year of change and challenges. Nationally, many health care organizations, like us, are working against the tide of stagnant reimbursements, increased expenses, growing needs of an aging population, and competition for patients and providers. Baystate Health overcame these challenges through teamwork and collaboration and by funneling our energies toward the compass points we’ve established for our strategic plan — Baystate Health 2020. These compass points can be summed up in a few short words: patient safety, quality of care, patient experience, and value. Our continued focus on measurement and improvement in these important areas means we strive to be better today than we were yesterday. Our patients and communities expect this from us and we are committed to delivering on our promise that together we deliver a higher state of caring. In 2016, the work of 12,000 team members in support of our patients earned national recognition for health care quality and innovation. Baystate Medical Center was recognized by Truven® Health as a 50 Top Cardiovascular Hospital and ranked the third-best hospital in Massachusetts according to the latest U.S. News & World Report ‘Best Hospitals’ rankings. Baystate Medical center also achieved Magnet® recognition from the American Nurses Credentialing Center, a distinction that places the hospital’s nursing staff among the finest in the nation. For the fifth consecutive year, Baystate Health earned a ‘Most Wired’ designation from the American Hospital Association’s Health Forum for our efficient use of electronic medical records. Visit our awards section and highlights section to learn more about these and other national recognitions in 2016. We made significant investments in our communities through facilities upgrades to ensure quality care for our patients. In Greenfield, a $26 million state-of-the-art surgery center at Baystate Franklin Medical Center was supported in part by a successful Baystate Health Foundation capital campaign that raised over $5 million. We thank our community members and Baystate employees who demonstrated their belief in keeping care local. In addition, we opened two new floors in the Baystate Medical Center expansion project, moving medical and surgical patients from some of the oldest areas of the hospital to contemporary units with private rooms and comfortable family space. And, plans were launched for a new, larger replacement Emergency Department at Baystate Wing Hospital in Palmer. We consolidated inpatient services in the Baystate Health Eastern Region, transitioning Baystate Mary Lane Hospital in Ware to a freestanding emergency facility and outpatient center as part of Baystate Wing Hospital. Reinventing care at Baystate Mary Lane Outpatient Center included listening and responding to the community’s passionate support for ensuring excellent care locally. The range of outpatient services continues to expand as we bring more specialists to the area. Being an academic health system allows Baystate Health to attract top professional talent, provide for the workforce of the future, and furnish cutting edge therapies to the residents of western Massachusetts. The academic highlight of 2016 was the completion of our partnership with the University of Massachusetts Medical School (UMMS) in Worcester to create its first regional campus — UMMS-Baystate, located in Springfield. The new medical school will enroll up to 25 students per class beginning in 2017 in a unique tract called PURCH (Population-based Urban and Rural Community Health). The goals of the PURCH program are to increase access to Massachusetts students seeking an affordable medical education; to respond to the health care needs of the Commonwealth by increasing the number of Massachusetts physicians trained in urban and rural primary care; and to apply proven academic research methods to improve population health, reduce health disparities, and make health care better integrated, more efficient and more effective. We begin 2017 on strong footing, having responded to an anticipated $75 million budget gap through an intense and collective approach that included a mixture of budget actions. During the year, both Moody’s and Fitch’s reaffirmed the Baystate Health bond rating (A2 and A+ respectively) with a stable outlook, reinforcing the assessment of Standard & Poor’s (A+, Stable) from the prior year. We continue to look for ways to improve quality and safety and the experiences of our patients seeking care in our outpatient practices and hospitals. We appreciate the support of our community members who volunteer, donate to our Foundation and seek us out when they need care. We have outstanding providers, committed leaders, and compassionate team members in every corner of this organization ready, willing and able to deliver on our promise of a higher state of caring.